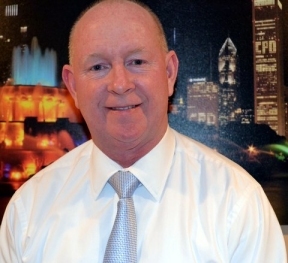 Bill Dougherty recently announced his candidacy for Fraternal Order of Police (FOP) president Chicago Lodge 7 for the upcoming primarily elections to be held March 6. Dougherty joined the Chicago Police Department in 1987 and worked in the 009th, 008th and 22nd districts as a patrolman and tactical officer. He began his FOP career as a watch representative in the 009th district. In 1999 Dougherty served on the board as a trustee for a three year term. He was elected to the office of first vice president of the Fraternal Order of Police, Chicago Lodge 7 in March 2002 and became a field representative. He is in his fourth term as first vice president. Dougherty currently co-chairs the Grievance Committee and also serves on the Legal Defense Committee, Political Action Committee, Picnic Committee and Golf Committee for the Lodge. Bill has previously served on the Disability Committee, Awards Committee and the Legislative Committee. He and his wife Deb live on the Southside with their four boys, Kyle, Noah, Griffin and Ethan.